Home » AMAZAING NEWS » IS BLACKHOLE BLACK ? First lets see the formation of black holes ( life of a massive star). Stars more than six times as massive as our sun are called massive stars. A massive star has a shorter life span than the sun or other low mass stars. Hydrogen present in the core of massive stars is used up with a much faster speed. So one time comes ( which is about 50 --100 million years ) when no hydrogen is left in the core of a massive star. At this time it is becoming worse, the core collapses and the star become 1000 times greater than its original size. It is now called giant stars named as supergiant. With the passage of time the supergiant become so dense that it cannot bear the pressure of outer layers. The outer layers start to crash inward with a tremendous explosion which is called a supernova. At the time of a supernova the light of stars became much more than all other stars of the galaxy. Great shells of gases fly off the store. Only the tiny core of the star remains left. This store contains only neutrons so it is called a neutron star. It is extremely dense some times after the supernova explosion the massive star becomes a black hole. 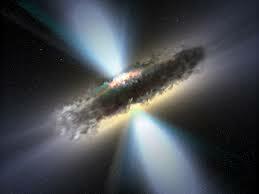 A black hole is so dense that nothing can escape from it due to its very strong gravity. Even light cannot pass or escape from it due to its strong gravity and it is no more glowing. In fact the black hole is the last stage of the cycle of a massive star. They have some other sources of sustaining them like interstellar light and gas. If you were to take a step into a black hole, you would stretch like spaghetti; the gravitational pull of a stellar-mass black hole could lead to spaghettification. As you fall into the black hole, you approach the speed of light; the faster you move through space, the slower you move through time. So if you're able to look forward toward the black hole, you see every object that has fallen into it in the past. And then if you look backwards, you'll be able to see everything that will ever fall into the black hole behind you.